It all happened in a flash of black and the terrifying sound of shots fired in the dark. It was 10 December 1989, the height of the Government’s counterinsurgency against the violent 1987 Marxist uprising. Shantha Pathirana watched helplessly as his twin brother Sudath was dragged out of his Borella home by pistol-wielding men dressed all in black. Shantha and Sudath looked remarkably alike. The abductors were taking no chances. They wanted the ‘insurgent’ in the family. The gunshots fired into the night skies had not only put an abrupt end to the women’s weeping. It also ensured curious neighbours stayed well away from the scene of the abduction. Sudath Pathirana was a trade union activist at the Jayewardenepura Hospital, working for the Nawa Sama Samaja Party (NSSP) then led by Vasudeva Nanayakkara. A fellow activist, Somaweera was also abducted from his home at the same time on 10 December 1989. Neither has ever been heard from again. Disappearance is an invisible crime; there are no bodies, no graves and no traces of abuse. There is only silence. And trauma relived day after day by families who have watched loved ones being snatched away, never to be seen again. For the Pathirana family, the search that began in 1989 has never ended. Shantha’s father Wijeyadasa Pathirana joined the ranks of thousands of families of the disappeared that were being mobilised by Nanayakkara and his erstwhile activist colleague, the SLFP MP Mahinda Rajapaksa. After working underground for a few months, Wijeyadasa would go on to found the Organisation of Parents and Family Members of the Disappeared (OPFMD) that joined movements including the Mothers’ Front convened by SLFPers Mahinda Rajapaksa and Mangala Samaraweera. These groups joined the struggle against an increasingly brutal UNP regime, together with civil society activists, academics and journalists that were agitating for a change in the status quo. In 1994, the 17-year reign of the UNP ended. Chandrika Kumaratunga, who had also campaigned alongside the families of the disappeared and other victims of the former regime’s brutality, was elected President. When Kumaratunga established a Presidential Commission of Inquiry into involuntary disappearances in 1994, Shantha’s father mobilised thousands of families under the OPFMD umbrella to testify. The Commission documented more than 20,000 complaints and established that more than 16,000 amounted to enforced disappearances. The Commission identified several thousand suspected perpetrators in more than 1,000 cases. Less than 500 were indicted and even fewer convicted. The Commission also recommended the establishment of an independent Human Rights Prosecutor to investigate and prosecute human rights violations in general and disappearances in particular (US Institute for Peace: Commissions of Inquiry, Sri Lanka). Key recommendations of this Commission, suggesting reforms to end impunity for the crime of enforced disappearances, were not implemented under the Kumaratunga administration. Abductions and extrajudicial killings continued in the conflict zones. The Rajapaksa administration that would follow executed its own era of state terror. During the Rajapaksa regime’s crackdown on human rights activists, critics and civilians in the North suspected of insurgent activity after the end of the war, enforced disappearances became a fearful weapon in its arsenal. Under pressure internationally to deal with this fresh wave of impunity, the Government established the Lessons Learnt and Reconciliation Commission (LLRC) and the Paranagama Commission after the war ended. The LLRC called for a probe into enforced disappearances while the Paranagama Commission documented over 20,000 complaints of disappearance, predominantly in the formerly embattled North and East. During the Paranagama Commission’s public sittings in the Northern Province, hundreds of families testified about family members who had disappeared after surrendering to the armed forces at the end of the war in May 2009. The LLRC had recorded similar testimony during its hearings. Many of those who had surrendered had been members of the LTTE, some of them very young conscripts. Post-war, the disappearances in the North and East continued. A spate of abductions by white vans around the island struck fear in the hearts of citizens. Many of these abductions took place in the capital Colombo and its suburbs and involved high-profile journalists and human rights activists. Impunity for these abductions was so widespread that there were allegations that the abduction squads had also begun to run private operations, abducting businessmen for ransom and extortion. For activists like Shantha, it was like a recurring nightmare. Sustained impunity for the crime of enforced disappearance had emboldened successive Governments to use the repressive tactics they had campaigned against while in the opposition. Disappearances were not the exclusive domain of any one political administration. It had cut across decades and political parties; across class and ethnic boundaries; across insurgencies and civil war. And since 1971, as decade followed decade, thousands of families of the missing have joined a never-ending search for answers. 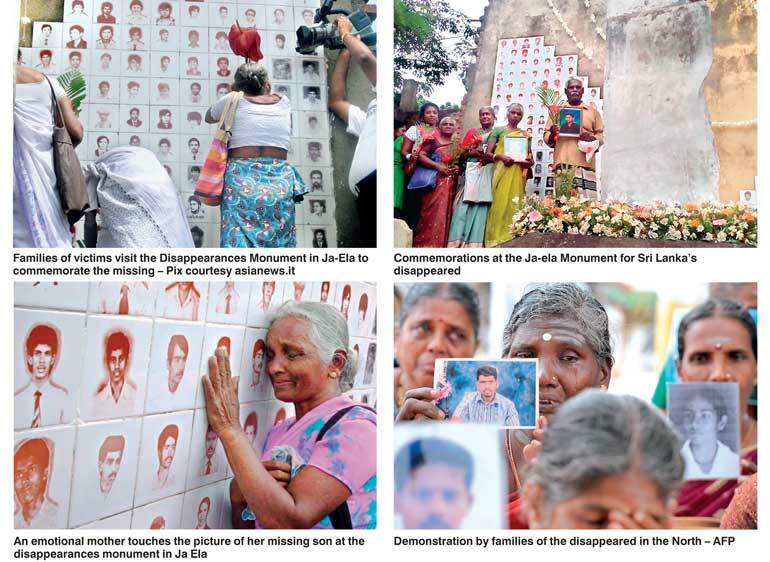 It is against this backdrop that legislation to establish a permanent institution to trace missing persons, investigate the circumstances of their disappearance and recommend redress for their kin was controversially passed in Parliament last week, amid howls of protest by the pro-Rajapaksa ‘Joint Opposition’ cadre. It stands to reason that if key figures of the Premadasa administration responsible for the brutal counterinsurgency in 1989-90 were represented in Parliament last Thursday, the move to set up the OMP would have met similar resistance. The OMP’s open-ended timeline makes it a mechanism to serve victim families of two failed Marxist insurrections, a 26-year civil war and its aftermath. This should have made it acceptable to former President Rajapaksa, a disappearance campaigner in the 1990s. But the OMP was initially proposed at the UN Human Rights Council in Geneva, as a first step in a mechanism that will conclude with the establishment of a special court or chamber to prosecute alleged war crimes. The Office of Missing Persons will have no power to prosecute perpetrators of disappearances. Yet the ex-President’s real worry is the special court that will undoubtedly probe allegations of indiscriminate shelling, extrajudicial killings and sexual violence during the final stages of the war his Government presided over. With the OMP legislation through the House, the Government will soon shift focus to establishing the second and third promised mechanisms; a truth and reconciliation commission and a special court and independent prosecutor to try gross human rights abuses. Derailing efforts to get the OMP legislation enacted would have stymied Government plans for future mechanisms to deal with wartime abuses that would face much stiffer resistance from political parties represented in Parliament. This was the Joint Opposition brief when Parliament convened to debate the OMP bill last Thursday, and they set about it with a vengeance. On 5 August, former President Rajapaksa set off on a tour to South Korea. It was around that time that the Government learnt of the Supreme Court Determination striking down the VAT bill that was due to be taken up for debate in Parliament on 11 August. The decision meant that the VAT bill could not be debated in its current form and would have to be reintroduced at a later date. The OMP Bill was originally scheduled to be debated on 23 August. The Government made a split-second decision over the weekend to bring the debate on the OMP Bill forward to 11 August, since the VAT bill could no longer be taken up on that day. At the Party Leaders’ meeting in Parliament on Tuesday, the Government announced it wished to present the OMP Bill for debate on Thursday (11). The main opposition Tamil National Alliance was in agreement, but the JVP initially strongly disagreed. When the Government argued that the OMP was a critically important piece of legislation that needed to be enacted as soon as possible, and proposed a debate and vote on Thursday and Friday, the JVP insisted that there was no reason to rush the bill, which could be taken up for voting when Parliament sat in the third week of August. The JVP had proposed amendments to the OMP Bill which the party was keen to see discussed and included in the final draft. The Joint Opposition strongly backed the JVP position on the debate and vote. On Wednesday when the party leaders met again the Government reiterated the importance of enacting the OMP legislation. The JVP finally agreed to postpone an adjournment motion it was scheduled to move on Thursday, 11 August, in order to allow debate on the OMP bill to continue till 6.30 pm that day. The TNA, which also had an adjournment motion scheduled that day on the issue of political prisoners, agreed to defer the motion to permit an extended debate on the OMP Bill. The agreement between party leaders last Wednesday (10) was that the OMP bill would be debated till 6.30 p.m. on Thursday with the debate resuming the next morning (12) and a vote on the bill at 11.00 a.m. Nonetheless, when Parliament reconvened on Thursday, Joint Opposition MPs filed into the chamber sporting black armbands and neck-ties and proceeded to argue with the decision made by party leaders on Wednesday about the debate schedule. When Speaker Karu Jayasuriya refused to budge on the issue, the JO MPs stepped into the Well of the House creating a ruckus. Continued disruptions forced Speaker Jayasuriya to suspend sittings for 45 minutes. During this suspension of proceedings, party leaders met again with UPFA MP Dinesh Gunewardane representing the Joint Opposition. The JO Parliamentary Group was demanding a two-day debate on the OMP Bill on Thursday (11) and Friday (12) followed by a vote to be taken when Parliament reconvened during the third week of August. Government MPs suspected that the demand for a drawn out timeline on the OMP legislation was a delaying tactic by the pro-Rajapaksa faction. The ex-President was to return to Colombo on the afternoon of 12 August. If the Government stuck to its schedule on the OMP vote, the legislation would be enacted by the time Mahinda Rajapaksa touched down. While it is unclear why the JO appeared to be under instructions to delay the vote, political observers suspected that the UPFA rebels were planning public demonstrations and sit-ins to protest the OMP legislation, with Rajapaksa leading the fray once he returned from overseas. By whipping up popular opinion against the OMP, the Rajapaksa strategists would have hoped to sway a jittery SLFP faction in the ruling coalition into backtracking on the legislation. While this may have created a crisis in the ruling coalition, it would not have put the bill in danger of being defeated in any way, since the TNA and JVP would have backed the UNF-led Government to pass the legislation. During the party leaders meeting which took place while proceedings were suspended last Thursday, Gunewardane insisted on a longer debate on the OMP. The TNA and the JVP, both parties having decided to defer their adjournment motions scheduled for 11 August, suggested debating the bill until 9.30 p.m. that night and continuing the debate the following morning. Agreeable to this proposal, the Government also agreed to push back the vote until 2.00 p.m. on Friday. But Gunewardane still insisted that this was not enough time. “We have 51 MPs. All of them want to speak on this bill,” he claimed. “Then Dinesh, let’s sit throughout the night and debate the bill,” suggested Opposition Leader R. Sampanthan. None of the proposals found favour with Gunewardane, and when sittings resumed the JO continued to disrupt proceedings. Gunewardane charged that the Government was being undemocratic by refusing to permit sufficient parliamentary debate on the bill. Speaker Jayasuriya decided to plough through the proceedings, calling on the Government to present the OMP Bill. Minister Mangala Samaraweera presented the bill to the House, amid deafening disturbances and heckling by the JO. Continuing to ignore the JO, the Speaker called upon TNA MP M.A. Sumanthiran and JVP MP Bimal Ratnayake who were also listed to speak during the OMP debate. Realising the JO was determined to delay affairs, Government strategists decided to outwit them. Messages were sent to MPs Sumanthiran and Ratnayake, requesting them to wind up their speeches because the Government was going to put the bill to the House immediately. The Speaker offered the JO an opportunity to speak at the debate, but only if all 25 MPs returned to their seats. When the calls went unheeded, the OMP Bill was put to the House in its Second and Third Reading, followed by a chorus of ‘ayes’ from Government and Opposition benches which comprised the TNA and the JVP. Gunewardane, standing in the Well of the House, was demanding a vote on the bill, but not being near a microphone, he was neither heard nor recognised by the Chair. And so amid the pandemonium, the OMP Bill was passed into law without a vote and with no participation by the pro-Rajapaksa faction officially recorded. In the confusion, it is yet to be made clear which amendments that had been proposed to the Bill had been put before the House in the Third Reading. As a first step in a process to come to terms with a violent past, the OMP Bill was an important piece of legislation that should have been subject to robust parliamentary debate and committee. But pointless disruptions by the pro-Rajapaksa faction and the Government’s concern that the legislation was at risk if delays helped to mobilise public support against the OMP, led to its enactment in a less than ideal way. The Government’s own communication failures as it pushes forward on establishing institutions to deal with the past is empowering the Joint Opposition and permitting the small faction of UPFA rebels to seize the narrative on the Government’s truth and justice project. In many ways, the debate on the Office of Missing Persons was an eye-opener about challenges ahead for the Government as it seeks to set up ever more controversial mechanisms to deal with wartime abuses. Minister Samaraweera, who fought tooth and nail for the OMP legislation, is determined to push through with the next steps. He hopes to bring legislation to set up a Truth and Reconciliation Commission by September or October this year and have a rough framework for the Special Court to prosecute major rights violations by March 2017. He will have his work cut out for him as he battles hardliners at home while ensuring his Government lives up to its international commitments. With the enactment done and dusted, the next task before the Government will be to appoint independent and credible commissioners to run the Office of Missing Persons. Families of the disappeared have gone before multiple commissions, repeating their stories to panel after panel in the hope of finding answers. The Government will need to act decisively to empower the OMP with individuals and resources that will demonstrate to thousands of victim families that this time will be different. The fundamental task of the OMP should be truth-seeking, says Shantha Pathirana, who has been searching for his brother for the past 20 years. “Where are the bodies? Where are the graves? Where were they held? These are the answers we want,” he insists. As a disappearance activist, Shantha also points out that investigations have been the weakest aspects of commissions of inquiry on disappearances, with special police units and the Attorney General’s Department tasked with probing and prosecuting complaints. “Without independent investigators any process to trace the disappeared is flawed. This is a lesson the OMP must learn from commissions that have gone before,” he explains. Advocates of the OMP legislation enacted by Parliament last week explained that the permanent office would have the power to hire investigators, including independent law enforcement officials. People like Shantha who campaigned against enforced disappearances alongside the former President remain incredulous about his current opposition to the establishment of a permanent Office of Missing Persons. But he also admits that over the years, disappearances activists have repeatedly been betrayed by their own. Frustrated by the Kumaratunga administration’s failure to deliver on justice and redress for families of the missing, Shantha and his OPFMD strongly backed the candidature of Mahinda Rajapaksa at the 2005 presidential election. The disillusionment that would follow was unprecedented. The OPFMD was fractured during the Rajapaksa years, as irreconcilable political differences emerged, with one faction backing the President while the other condemned his Government’s policies. It was uncanny how the tables had turned, says Shantha, reflectively.